"Nothing ever changes; it is always a good experience." "I had a lot of work done on my 95' BMW. Mike and Jeff were prompt and respectful in dealing with me and thorough in their work. What more can you ask?" "I was very happy with Bridgewater Motor Works, LTD. I explained my car's symptoms and later that day they called and told me what the problem was. They also put it on the computer and gave it a good check up. It was ready the next day. The folks were friendly and knowledgeable. I will continue to use Bridgewater Motor Works, LTD. to work on my MB CLS500 and would highly recommend them!!" "I am very satisfied with your services; your prices fall well within my budget, and the good natured commentaries make me feel right at home. I will always recommend Bridgewater Motor Works to my friends and neighbors. All the best." "I brought my car in for a timing belt at almost 180,000 miles and for a problem with hard hot starts. Unfortunately, it was discovered that the car also needed the turbo replaced again. I had to decide whether or not to fix the car knowing the high cost of repairs as opposed to getting rid of it and purchasing another vehicle. I think I received good advice to have it fixed and I trusted their judgment to have the work done. Mike and all of the service technicians were professional, personable and fair. I will continue to bring my car to Bridgewater Motor Works for as long as they can keep it running. These folks have been the only ones who have been fair and honest (and been able to actually fix the problems) during the many years I have brought the car in. Thank you Mike and Co."
"Excellent service. Friendly staff. Great prices. What more could a customer want?" "Top notch! You're worth the 2 hour round-trip drive to get my car fixed. Thanks for the superior service to my BMW's over the years!" "Excellent service. Will not go any place else for service for my Volvo. Very pleasant and they make you feel comfortable while waiting for your vehicle." "What a great company. They explained the process and kept me informed throughout a major engine repair. The best part, the final price was about 10% less than the quote! When was the last time that happened to you? My car is running superbly. 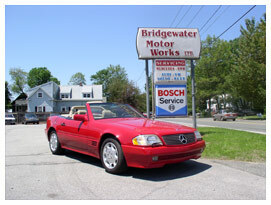 If you need work done on your car I recommend you call Bridgewater Motor Works."